This ramp is constructed with steel columns and innovative tapered steel girders with precast concrete floor panels and cast-in-place concrete topping. This system allows rapid erection and permits the floor to be shaped for positive drainage and more durability. It can accommodate up to 750 vehicles and has stair towers at three corners with elevators at the northwest and southeast corners. The structure is located to the south of the United States Federal Building and is connected to the City of Des Moines skywalk system. 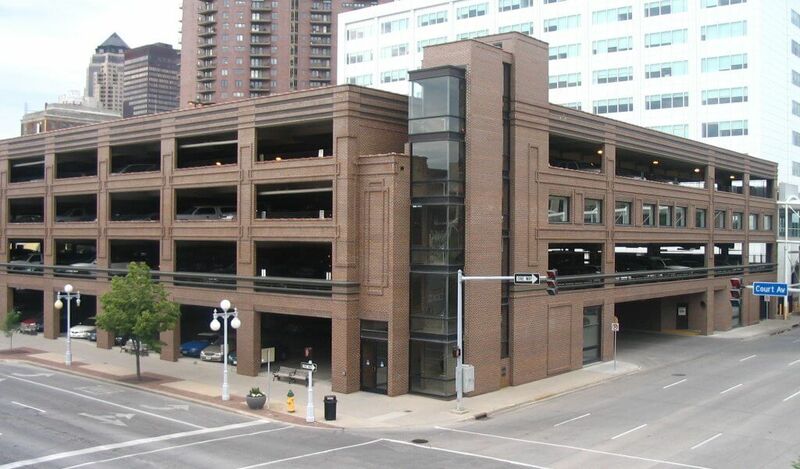 The parking ramp’s brick facade and intricate masonry details were chosen to complement the Court Avenue Historic District. Shuck-Britson provided structural design and construction administration services for this project.